I love a great Peter Pan collar so it was no surprise that I instantly fell in love with this embellished version from Forever 21. Since the top is quite feminine, I decided to balance things out by pairing it with my favorite pair of distressed flared jeans and a classic oversized bag. Oh, and did I mention the top was just under $23?! Talk about a score! love your 7 for mankind flare jeans! I love your top! You are always nice even in casual! love the top and this casual style ;)! Love the top! Such a steal for under $23! This is such a gorgeous look! I love the combo, it is chic and sporty! And thanks for your lovely, motivating comment... And for your support, too! What a gorgeous top - love it with the flared jeans! I love that top, hun! Looks fab.. and what a steal for only $23. Yay! Wowwwww NICE TOP!!! the detail on the collarneck is fantastic! Cute detail on the collar. Nice look. You look so chic and cool!! Oh wow! thats from F21! Ive never been lucky with F21. Love it!! I saw that top too and now I wish I had gotten it. It looks fantastic on you! Love it when you find a gem at f21. I love an embellished collar! 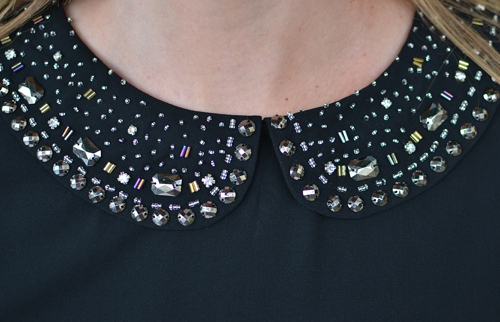 The embellished Peter Pan collar is absolutely fun! Love it. That collar gives the outfit a "rockstar" glam vibe! Cute top! The embellishments make it so pretty and unique! We will be getting a Forever21 in Vancouver soon... I will check it out for sure! Oh no you did-n't!!! I literally just came home from a shopping jaunt at F21 and the only thing I picked up was this SAME gorgeous top! Can you believe the collar and all its fabulosity?! Sooooo dang chic, I bought it since I know we'll be rocking it all through Fall/Winter! You're right on the money honey! Great find Audrey! I love that you paired the chic top with your casual jeans. don't you just LOVE great f21 finds?!?! you look adorable. and i totally want to steal those jeans!!! I love how casual and glamorous it is! You always find such great F21 options! I usually only have little time to whiz through the store because i am always around one for work and am thinking you must have to dig... I guess it is usually in NYC on 5th so perhaps that location is picked over... wish i could find a lower traffic one so i could find some gems!! What a cute cute top Audrey....Forever 21 will always be a destination for FAB but inexpensive stuff!! Such a fun find! Loving that top and your bag! Oh, man. I think I just fell hard for that top's collar. For serious. I'm a sucker for metal embellishments! I'm loving your peter pan collar! Hard to choose! I love the Zebra Swirl shift skirt! The combination is unexpected and works really well, love this!